Friendship Circle is a nonprofit organization that pairs teen volunteers with an individual with special needs. Together, they form a lasting friendship and participate in one of our 40 weekly and seasonal programs. Efshar Circle provides a Hebrew and Judaic education for children with special needs. Teachers focus on engaging the child’s sense of Jewish identity through exciting, hands-on learning. Each student is paired with a one-on-one volunteer which enables students to learn at their own pace with individualized curriculums. No previous Judaic instruction is necessary. Teachers design curricula to meet each student’s current level and learning style. Efshar Circle is offered in partnership with the Jewish Federation of Metropolitan Detroit’s Opening the Doors Program. This program offers a unique opportunity for children to gain from group activities while still receiving one-on-one attention from their volunteers. Participants are divided into small groups to partake in structured activities and free play throughout the Friendship Circle facility. Activities include sports instruction, music and movement instruction, arts and craft, and free play in the activity wing and cheese-pit. Sunday Circle is a two hour drop off program creating a wonderful respite opportunity for parents. Pathfinders is a social outing program designed for participants who can safely attend community outings without a one-on-one volunteer. The outings are planned to give participants exposure to outdoor exploration, music, swimming, art, and social excursions. Pathfinders takes place outside of Friendship Circle, giving participants the opportunity to socialize with their peers, practice social interactions with community members, learn life skills and have fun! *Drop off and pick-up at each site location. During Teen Trips, participants and their one-on-one volunteer go on weekly outings in the community to participate in meaningful projects and social opportunities. These trips give teens and young adults the opportunity to socialize with their peers, practice social interactions with community members, learn life skills and have fun! Weekly outings include bowling, going to the mall, swimming, visiting parks, museums and more! This six week basketball clinic is a great opportunity for players to build motor and social skills while playing basketball. Skills include ball handling, offensive and defensive strategies, zone and man-to-man defense, passing and moving with and without the ball and more. During the session players run drills, play basketball style games and scrimmages. This program does not offer one-on-one volunteers and is appropriate for players looking to build skills in the game of basketball. The spring Floor Hockey Clinic is offered with equipment proudly sponsored by the Detroit Red Wings. Our Floor Hockey Clinic creates an inclusive environment where players of all abilities can enjoy the game of hockey while benefitting from exercise and movement. This program offers one-on-one volunteers and is appropriate for all ability levels. Each week, participants meet their volunteer at Friendship Circle to enjoy one-on-one free play with full use of the Elkus Gym, Bauer Activity Wing and multipurpose room. Kids and buddies start each week with a welcome circle in the gym. Participants are then encouraged to create their very own schedule of free play to maximize fun! During Social Circle, the art room and water room offer a different, in-room activity each week. Participants will also be able to put together their own snack in the apartment! *NEW FOR MONDAYS* Bring Your Own Game (BYOG!) will take place every week from 5-6pm. All Social Circle participants are welcome to bring their favorite board game or cards from home, to enjoy with a group of friends! *NEW FOR TUESDAYS* Bring Your Own Homework (BYOH!) will take place every week from 5-6pm. All Social Circle participants are welcome to bring homework from school! During our Intro to Art program young artists work in the state of the art Dresner Soul Studio inside Friendship Circle’s Farber Center. Participants will have the opportunity to explore fine art mediums under the guidance of facilitating artists at the Farber Center. Mediums include drawing, painting, paper mache, textiles and more. The art program is offered in two, eight-week sessions and is designed for participants who do not require a one-on-one volunteer. Friendship Circle’s revamped technology program will require participants to bring their own device! Led by Friendship Circle’s own tech extraordinare Jon, the Tech Teens program will teach participants the fundamentals of graphic design, programming and web creation. This program utilizes technology as a creative outlet, allowing participants to explore topics they are passionate about. 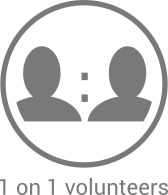 Tech Teens is tailored for teens and young adults who do not require a one-on-one volunteer. Open Gym allows participants an opportunity to get some exercise with their one-on-one volunteer in a fun, social environment. Gym time will include familiar games such as basketball, soccer and hockey as well as free choice, stretching, playground games and more. Open Gym allows each person to enjoy exercise and game play at an individual level while enjoying social interactions with their volunteer, coaches, and peers. Life Skills takes place in the state of the art Weinberg Village and gives participants the opportunity to practice life skills in a realistic, safe, and controlled environment. Focus areas for the village include street safety, money skills, personal responsibility, and inter/intra personal communication skills. Location specific goals include things such as visiting the doctor or placing an order in the cafe. Life Skills also offers a simulated job experience for all participants ages 13 and older. This unique program offers the excitement and fun of the village as well as serious life skill development. Drama is a theater program that uses acting and movement to empower performers to get on stage and shine. Participants will take part in a full theater experience beginning with creating the show, practicing, and then performing for a live audience. Our baking program invites future bakers to join a facilitated discussion on manners, recipes, and preparing food in a fun class environment with their one-on-one volunteer. Over the course of the program, participants learn food safety and prepare simple desserts that can be re-created at home. This program offers one-on-one volunteers and is appropriate for all ages. Kids, sibs, teens and adults are invited to join us for a fun, laid back movie night. We will gather in the multi purpose room for dinner (gluten free available) and then head into the theater to enjoy the show. Movie goers are invited to bring a pillow and/or blanket and are welcome to come in their jammies if they like. This two hour program is a great opportunity for parents to enjoy a date night, run errands or take a nap! 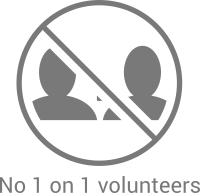 This program offers one-on-one volunteers. On Super Sunday, participants enjoy all of the fun of Sunday Circle PLUS a special show! Participants are divided into small groups to partake in structured activities and free play throughout the Friendship Circle facility. Activities include sports instruction, music and movement instruction, arts and craft, and free play in the activity wing and cheese-pit. Shows include magicians, music, science and more! This program is an extension of Sunday Circle, offering a special 1-hour addition to the typical respite opportunity for parents. On Super Sunday, participants and their volunteer go on an extended outing in the community to participate in a social opportunity, meaningful project and have fun! These trips give teens and young adults the opportunity to socialize with their peers, practice social interactions with community members, learn life skills and have fun! Outings include swimming, a trip to the movies, visiting parks, museums and more! This program combines Teen Trips and Pathfinders participants in an an extension of the typical Sunday program, offering a special 1-hour addition to the usual respite opportunity for parents. Register your child to participate in one of Friendship Circle’s programs. Register to volunteer in one of Friendship Circle’s programs.